Mind Enemies, the heavy metal project by Giuseppe Caruso, publishes their new live video from the “Russian Tour 2018” held last July. The songs are “My world” from the album “Revenge”, plus a brief tribute to the Pantera. This entry was tagged 2018, deahtmetal, hard rock, hardrock, LIVE, metallica, music, musicblog, rock, russia, tour. Bookmark the permalink. 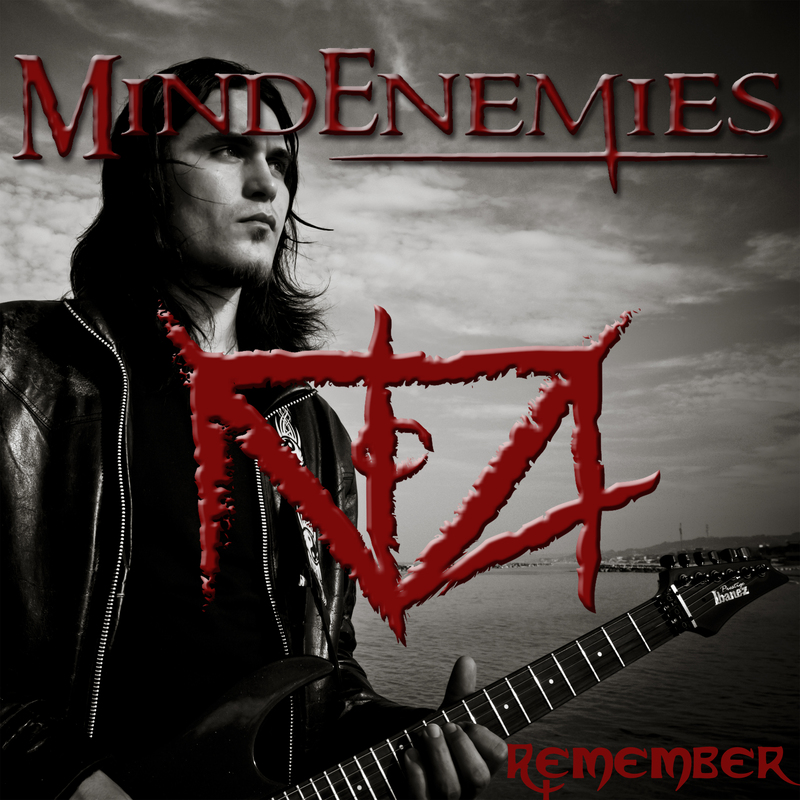 listen to the new Ep of Mind Enemies, “Remember” from which the official video was released, premiered on the 14th November. The Ep is composed of five tracks recorded by multi-instrumentalist Giuseppe Caruso in 2011. Differently from the album “Revenge” (2017) oriented more on Heavy Metal, in these pieces is marked an influence Alternative Rock, which characterized the first steps of the band. On December 29th they will present “Remember” live with a concert at the Centrale Rock Club in Erba (Como), followed other live bands that will take the band around Italy and abroad. You can listen to the five tracks in the links below. This entry was tagged album, ep, erba, foggia, hard rock, heavymetal, italy, LIVE, metal, newalbum, rock, sannicandro. Bookmark the permalink. directed by the director Vincenzo di Paola and with the participation of Francesco Rinaldi on bass and Francesco Petrillo on drums. The shots were taken at San Nicandro Garganico in Puglia (Italy), while the song was recorded in 2011 (Nadir Music, Genoa)) entirely for each instrument by Giuseppe Caruso. The single is the first extract of the band’s new ep eponymous, which will be on sale next December 13th. This entry was tagged alt, caruso, deahtmetal, deathmetal, etsy, facebook, goth, happy, hardrock, heavymetal, metallica, music, musicblog, musicvideo, nowplaying, pubblicazione, punk, punk #radio, rock, rockmusic, share. Bookmark the permalink. The journey through Caruso’s creation is like going through history of heavy rock music, where we find everything from hard rock through classic heavy metal, thrash, death, except for black metal. Giuseppe’s voice may seem over the top, at first, until you realize each phase actually matches the vocals as King Diamond announces the Mercyful Fate of “Satan’s Fall” with Dave Mustaine (Megadeth) rejoicing to see him “Rust in Piece” (The Black Warrior), Ozzy Osbourne (Black Sabbath) and Bruce Dickinson (Iron Maiden) croon (in British accent) on top of “Iron Man” (Goya) in “Fear Of the Dark”, while Bon Jovi lays you down in the “Bed of Roses” (Angel of Consciousness), Klaus Meine (The Scorpions) steals your heart (in a German accent) in the “Wind of Change”, “Crazy World” in “Dream Time” and John Lennon bids you to “Come Together” to “The Abbey Road” for “The Rock Rite”. When you listen closely you might recognize Megadeth’s “Peace Sells But Who’s Buying” riff patterns you might take for Annihilator’s (My World), Gregor Macintosch’s (Paradise Lost) gorgeous lead (Goya), the Iron Maiden of Adrian Smith or Dave Murray of Powerslave/Somewhere In Time fame (Angel of Consciousness) you may confuse with Mastodon or catch a doom/death of My Dying Bride on my favorite “Revenge”, all of the above examples by no means exhaustive of content. You can take Gene Hoglan’s (ex-Death) in “Goya” or Matthew Archer’s “Embraced” (Paradise Lost/Shades of God) drum patterns (The Rock Rite), Steve Harris’s (Iron Maiden) bass line (The Dark Life) Dave Mustaine’s knack for heart-wrenching melodies (Angel of Consciousness), Bon Jovi Richie Sambora’s (The Dark Life) or even Jimi Hendrix’s solos (My World) for a witness besides mine, “Revenge” is an immaculately skilled, executed and produced record. Why would I, then, find fault? Well, if The Flood is any indication, even God can make miss-takes. As any great artist, and, in this case, a pure musical genius, might be tempted to do, Giuseppe tends to get a tad self-indulgent, at times. “Black Warrior” may dazzle with power and meticulous attention to detail, on first or second listen, but further immersion reveals one of the weaker, simpler, songs. Similarly, you may marvel at Caruso’s fantastic “Rust In Peace”-worshipping “Wild Existence”, or My Dying Bridian “Revenge”with its incredibly emotional vocal delivery, stirring up dark emotions within you never knew you had, but get tired of hearing “South Park’s” Eric Cartman repeatedly sing of liberty in the Scorpionish “Dream Time”. Finally, after seventh revolution the charm breaks as you wish Giuseppe Caruso took more risks considering his amazing knowledge, skills and abilities (black metal?) Overall, I am very thankful for Giuseppe Caruso, his Mind Enemies and his “Revenge”. All the instruments and production slay with vocals and songwriting in the upper tier. The time spent with his art has been very personally precious to me as he imparted additional therapy on my achey breakey heart (stuck in your head now courtesy of Billy Ray Cirus). I know Giuseppe will continue to amaze us in the age to come. Highly recommended, especially “Wild Existence” and the title track/closer. This entry was tagged alt, deathmetal, etsy, facebook, goth, happy, hardrock, heavymetal, music, musicblog, musicvideo, nowplaying, punk, punk #radio, rock, rockmusic, share. Bookmark the permalink. 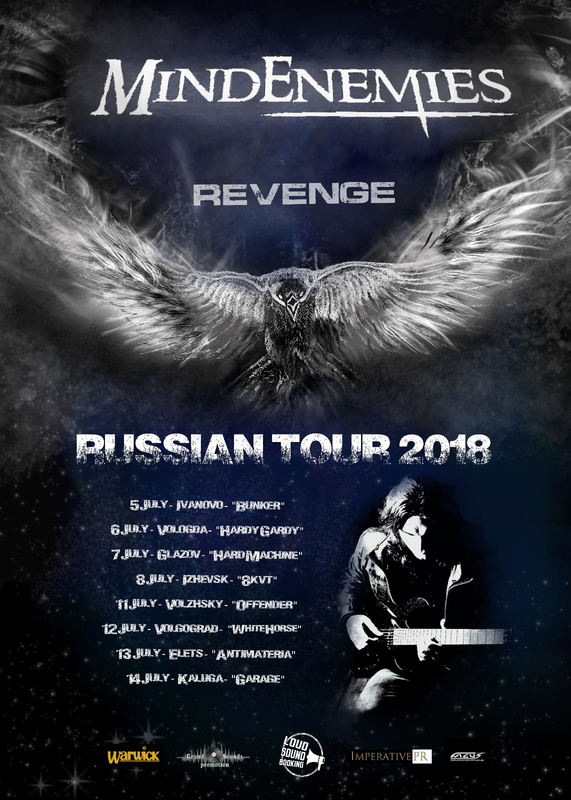 The “Mind Enemies”, a solo project by Giuseppe Caruso (voice, guitar) after the recent European tour in Belgium, Holland and Switzerland, continue the promotion of the album “Revenge” with a new tour that this time will take them to Russia, from 5 until July 14th. Alongside Giuseppe Caruso there will be Francesco Rinaldi on bass (Neka, Superzoo, Rocky Horror F.S., Necrotorture) and Francesco Petrillo on drums (Rocky Horror F.S., Pino Scotto, De Puglia Madre). This entry was tagged birthday, caruso, deahtmetal, debut, etsy, facebook, facusdrumitalia, giuseppe, goth, happy, happybirthday, hard rock, hardrock, heavy metal, heavymetal, instarock, ladies, lovecraft, metal, metallica, nowplaying, ozzysbourne, progressive, pubblicazione, punk, rock, russia, san nicandro garganico, share, theprodigy, tour, trip, true metal, warwick. Bookmark the permalink. <soeihfcnawevtnhya oherf hrfònrvlkds<nvl<-dn ldv no ifeyfwifgiuhvf.lzhfcn. “I Mind Enemies, creatura del polistrumentista Giuseppe Caruso (voce, chitarra, basso e matteria), pubblicheranno il loro debut-album, “Revenge”, il prossimo 13 agosto come autoproduzione. This entry was tagged debut, heavy metal, pubblicazione, rock, true metal. Bookmark the permalink. 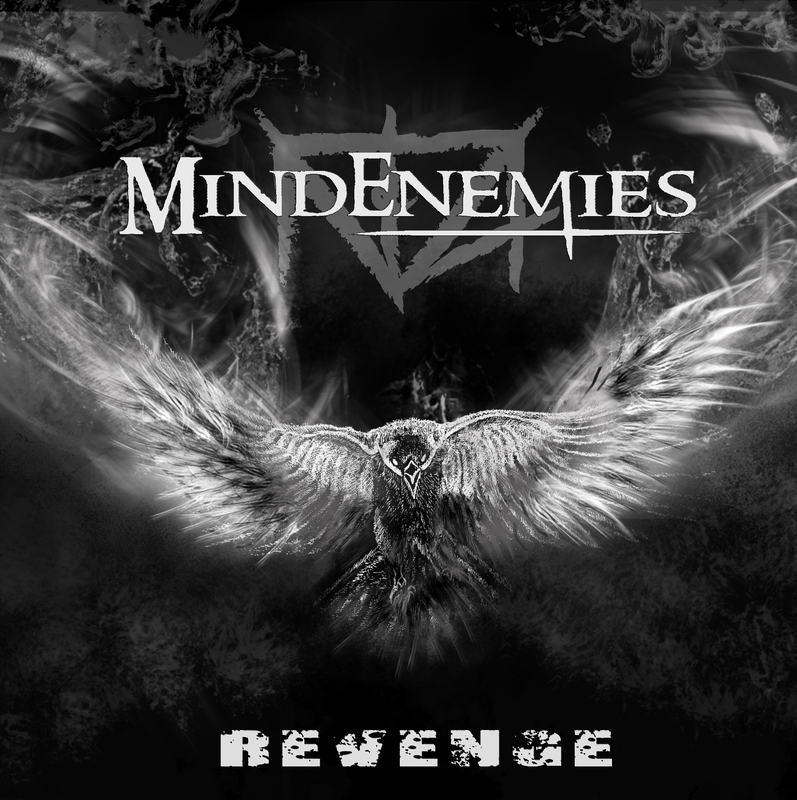 It’s finally here… Here’s the cover of the first full-Length album of mind enemies, that is called “Revenge”..
Nine track album. Compared to the first EP, the darkest way (2013), the genre will be oriented towards the heavy metal music with hard rock and metal. The official publication is planned for next August 13, both physically and digitally, on all digital stores (Spotify, Amazon music, Deezer, Google play etc. . The Cover Artwork was created by artist Tarì Tiziana Tedeschi. 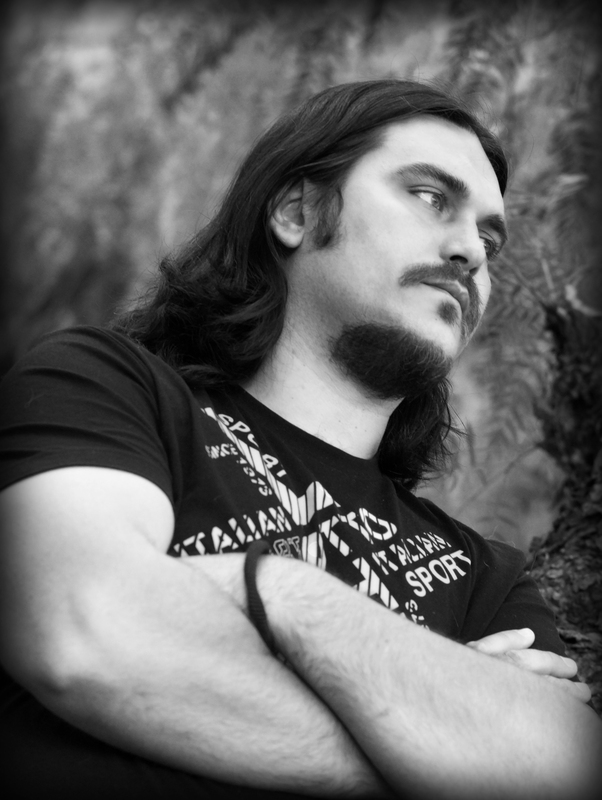 The album was recorded in the studio by Giuseppe Caruso (Guitar, vocals, drums, bass). Finalmente ci siamo…Ecco a voi la copertina del primo full length album dei Mind Enemies, che si intitolerà “Revenge”..
Il disco, sarà composto da 9 tracce. Rispetto al primo Ep, The Darkest Way (2013), il genere musicale sarà più orientato verso l’heavy metal con influenze hard rock e progressive metal. La pubblicazione ufficiale è prevista per il prossimo 13 agosto, sia fisicamente che digitalmente, su tutti gli store digitali (spotify,amazon music, deezer, google play ecc. ) . L’artwork di copertina è stato realizzato dall’artista Tarì Tiziana Tedeschi. This entry was tagged caruso, giuseppe, hard rock, heavy metal, metal, metallica, progressive, pubblicazione, rock, san nicandro garganico. Bookmark the permalink.